The first encounter between a European and a pineapple occurred in 1493, when Christopher Columbus went ashore on the Caribbean island of Guadaloupe where the sailors ate, enjoyed and recorded the curious new fruit. Reports and later samples of the New World's pineapple made the fruit an item of celebrity and curiosity for both gourmets and horticulturists. However, despite strenuous efforts by European gardeners, it was nearly two centuries before they were able to perfect a hothouse method for growing a pineapple plant. The pineapple became a celebrity fruit; its rarity, expense, reputation and attractiveness making it the ultimate exotic food item. The pineapple literally crowned the most important feasts: often held aloft on special pedestals as the centrepiece of the dining table. So sought after were the prickly fruits that they were rented to households by the day. Later, the same fruit was sold to other, more affluent clients who actually ate it. 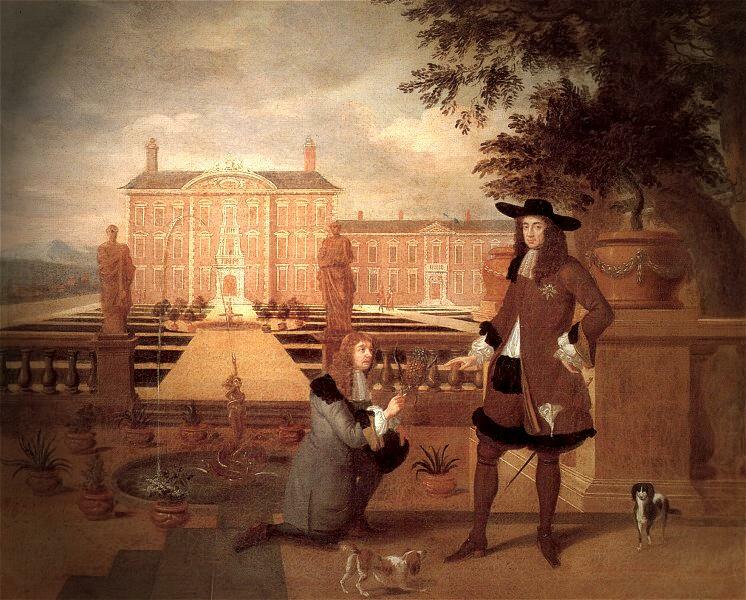 Into the 1600s, the pineapple remained so uncommon and coveted a commodity that King Charles II posed for an official portrait in which he is receiving a pineapple as a gift, an act then symbolic of royal privilege. The pineapple as a symbol of wealth and generous hospitality led to its adaptation as a motif for architects, artisans and craftsmen. Sculpted pineapples appeared as gateposts, weather vanes, and door lintels. They were stencilled on walls, woven into tablecloths, napkins, carpets and curtains, and painted onto the backs of chairs and tops of chests. 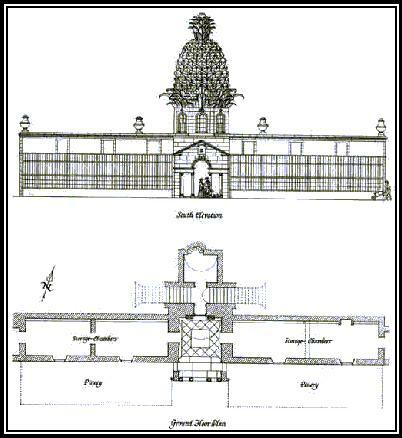 However, the use of the pineapple motif in architecture reached its climax in the colossal stone 'Pineapple' structure at Dunmore Park, near Airth in Stirlingshire which is probably one of the most fantastic buildings in Scotland. Constructed, by the fifth Earl of Dunmore as a garden folly, with a keystone dated 1761, the 'Pineapple' is built into the north wall of the walled garden, where it forms a focal point, standing 45 feet above ground level. 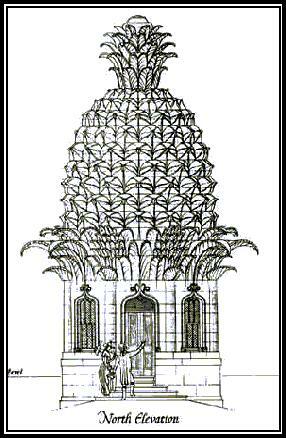 It is a remarkably accurate rendering of a pineapple, with each of the gently curving leaves being drained separately in order to prevent frost damage to the delicate masonry. The 'Pineapple' more than lives up to its description as a 'classical essay of novel conception', with its ingeniously constructed and incredibly realistic massive stone leaves cantilevered out from the main structure. Pineapples were scarcely seen at this time except by the very rich, so this stone copy must have astounded and bemused the local population. Pineapples had been grown in Scotland from the early 18th century and were cultivated at Dunmore in hothouses against the walls of the garden. The walls are of a double brick construction with an air gap and this allowed hot air to circulate for the benefit of the fruit trees. The architect of the 'Pineapple' is unknown. 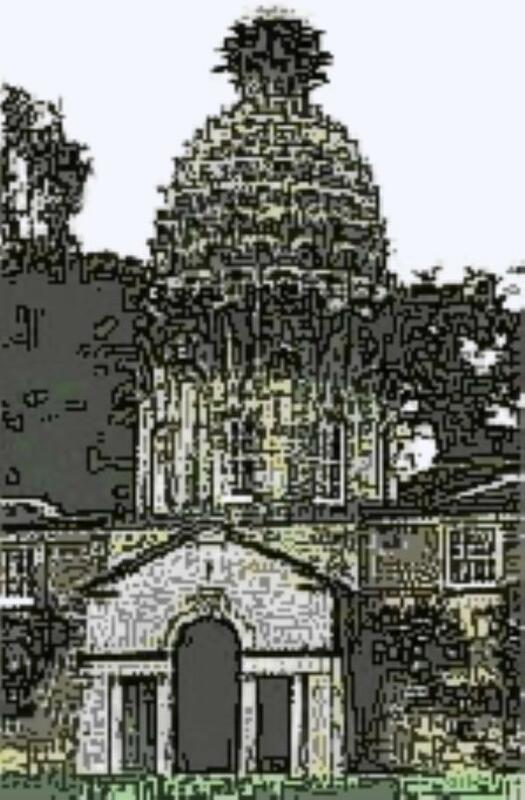 Tradition ascribes it to Sir William Chambers, who designed similar work at Kew Gardens, but he was working in London at the time it was built and it is not mentioned in his writings, as such a remarkable building surely would have been. 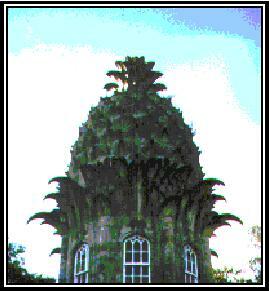 The National Trust for Scotland now owns the 'Pineapple' and it can be rented as a very unusual holiday home from the Landmark Trust.